DRILLING OPERATIONS takes 25 - 30 days An Oriskany well, top right , drilling to a depth of 8,000 feet on Laurel Hill anticline. The well is located two miles north of the Seven Springs Ski Resort. 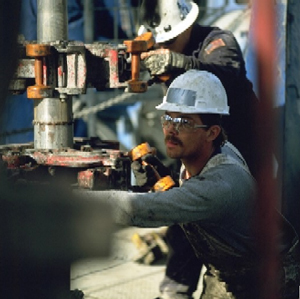 Only two acres are disturbed in the drilling process. When drilling operations was completed, those two acres were reclaimed and planted with wild grass, trees and wild flower seed. The remaining site has the wellhead, a meter, a water tank and a gas dehydration unit on it. The final site usually occupies a 50 foot by 50 foot area, the equipment can be fenced off. The access road will be maintained and gated with a lock. Only the land owner and Intrepid Exploration representatives will be given access to the road. 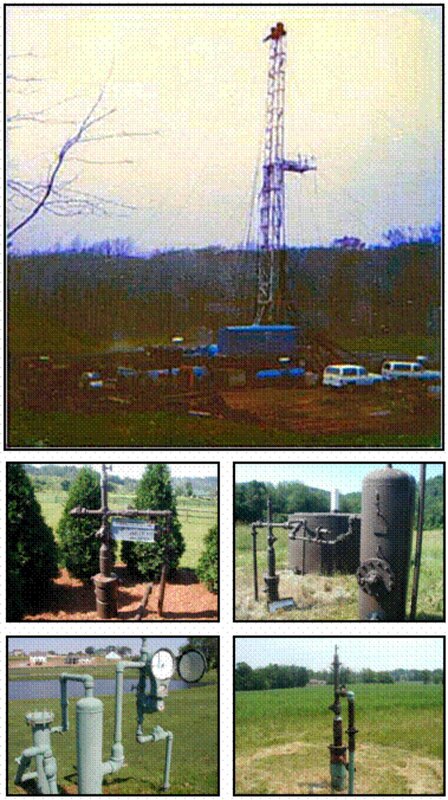 COMPLETED NATURAL GAS WELL To the lower right are four examples of natural gas wells. Notice the small "footprint" they have. These wells are easy to hide and enclose. Intrepid's wells will likely be attached to a 4 to 6 inch diameter pipeline. The Intrepid wells, unlike the photos, will have three circular valves on the wellhead which will work to accommodate the large flows and pressures. © Copyright 2007 INTREPID EXPLORATION, LLC. ALL RIGHTS RESERVED.